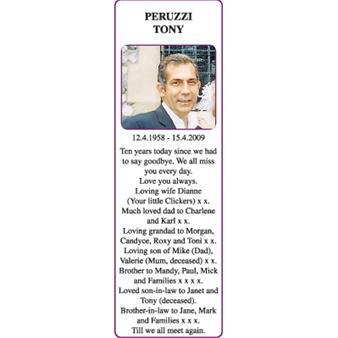 PERUZZI TONY 12.4.1958 - 15.4.2009 Ten years today since we had to say goodbye. We all miss you every day. Love you always. Loving wife Dianne (Your little Clickers) x x. Much loved dad to Charlene and Karl x x. Loving grandad to Morgan, Candyce, Roxy and Toni x x. Loving son of Mike (Dad), Valerie (Mum, deceased) x x. Brother to Mandy, Paul, Mick and Families x x x x. 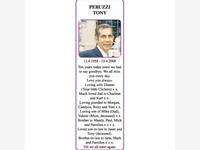 Loved son-in-law to Janet and Tony (deceased). Brother-in-law to Jane, Mark and Families x x x. Till we all meet again.